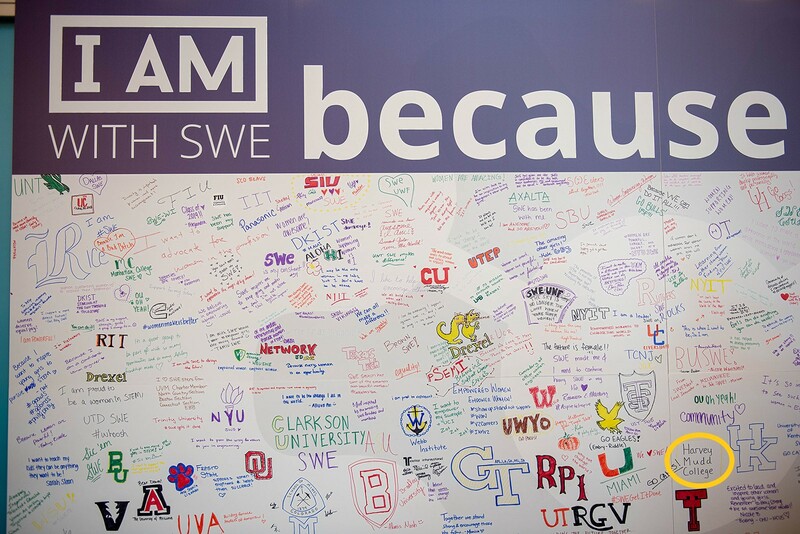 Every year, the Society of Women Engineers hosts a national conference in a city across America. 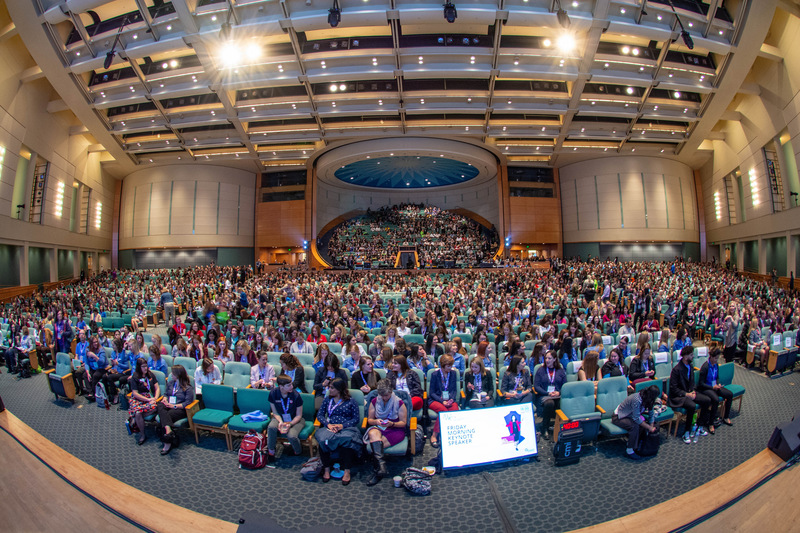 The conference is best known for its massive 2-day career fair, the many talks highlighting women in STEM, and networking between collegiate and professionals from around the world. Harvey Mudd’s SWE chapter sends between 15 and 30 members every year and this year was no exception. 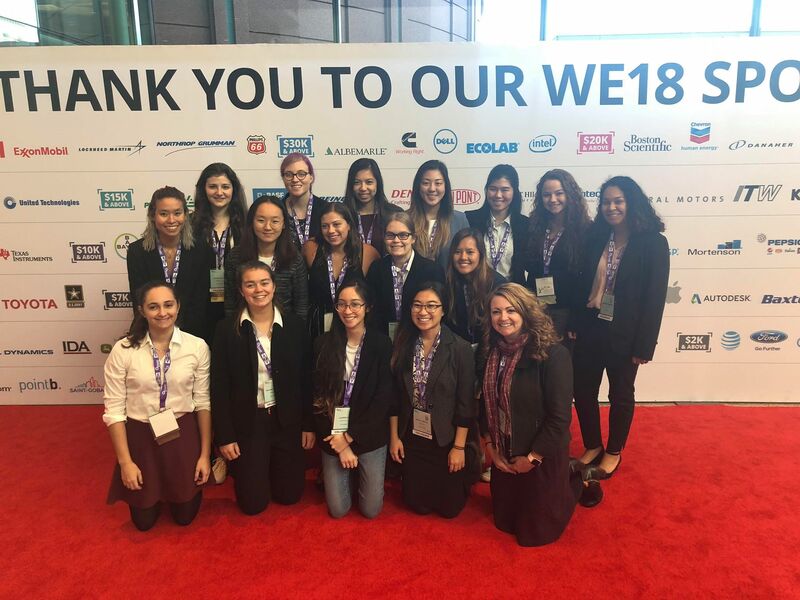 20 of Mudd’s very own women engineers traveled to Minnesota to attend the 68th annual conference a few weeks ago. This was my second SWE conference and certainly won’t be my last. 16 of our SWE members who attended the conference posing with Professor Orwin. Back row from left to right: Rakia Segev, Elizabeth Hedenberg, Xintong Wang, Diana Lin, Angela Sun, Andrea Zavala (me), Marisol Guzman. Middle row: Ice Limchantra, Xinyu Yang, Celeste Cerna, Elizabeth Poss, Aom Pongpiriyakarn. Bottom row: Katharine Larsen, Rachel Perley, Lauren Hu, Kayla Yamada, Elizabeth Orwin. 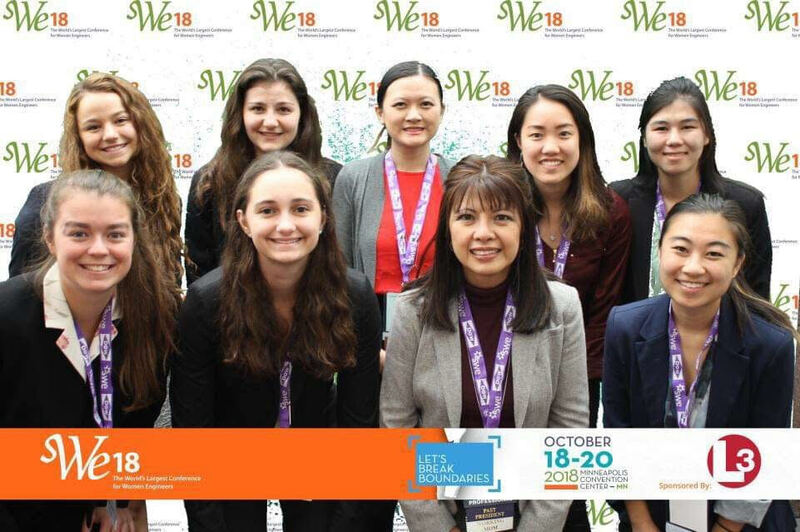 Attending the conference is a great way to meet and connect with fellow women engineers from Mudd and other schools or industry. Travel and housing are coordinated by our SWE chapter executive board, but we spend our time at the conference however we like.This freedom enables our members to craft an experience that suits each person’s goals and preferences, while also bringing together our SWE community from HMC. Whether you are looking for an internship, job, or graduate school opportunity, the SWE career fair undoubtedly has something that will interest you. Over 350 exhibitors are featured at the career fair. With more than 10 hours of career fair time, attendees have the opportunity to meet with employers seeking qualified and excited college students …or pick up all the free swag they can dream of! Seeking some “fempowerment”? Throughout the entire conference, there are numerous different sessions you are welcome to attend. These presentations include lectures and workshops (~60 minutes), lighting talks (~15 minutes), and panel discussions (~60-70 minutes). My personal favorites this year include Sabina Nawaz’s “Behind the Executive Curtain: One Surprising Secret How People Become Successful Leaders.” Sabina spoke on how negative self talk affects everyone, including and especially the most successful people. She provided tools for “filtering” through this “junk mail” and advice for how to best strive towards goals. You can check out Sabina’s talk here! Another one of my favorite talks was the session titled “Powerful Women at NASA”. This talk featured a panel of four female senior executive leaders from across NASA who discussed their experiences on their paths to leadership as women in STEM. These ladies were so down to Earth (space pun totally intended) and honest as they opened up about significant personal challenges that they have overcome. I left with a sparkle in my eye that hasn’t gone away since. 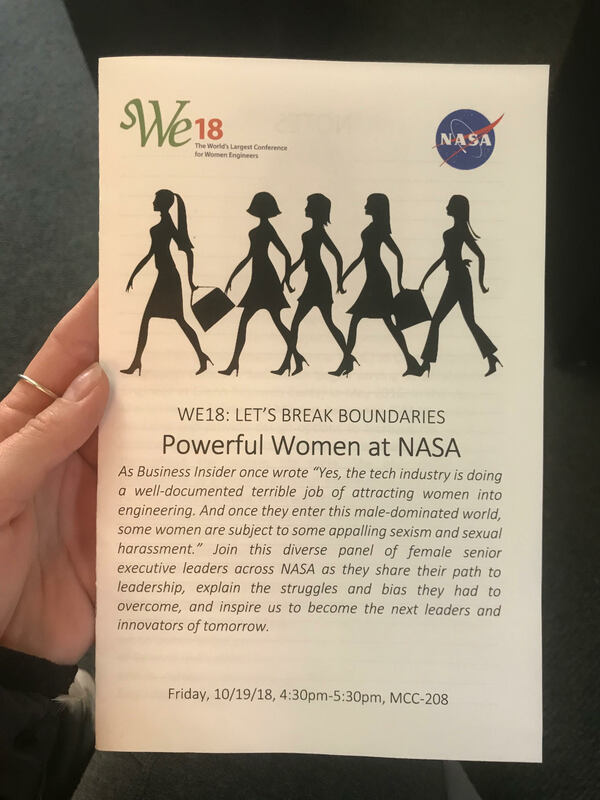 A picture of the front of my pamphlet for the Powerful Women at NASA session. Attending the SWE conference reminds me of the incredible importance of community, which is one of the central reasons why Mudd is such a special place to me. I’m thankful for the diverse gender representation at Mudd and knowing that women engineers can thrive here, together. Left photo: Our seniors! (From left to right: Ice Limchantra, Rachel Perley, Lauren Hu, Elizabeth Poss, Angela Sun, Kayla Yamada, and Marisol Guzman) Right photo: Some of our members having fun in the photo lab! Back row left to right: Andrea Zavala (me), Rakia Segev, Jeni Zhu, Cathy Chang, Angela Sun. Front row: Rachel Perley, Katharine Larsen, a nice lady we met, and Kayla Yamada.